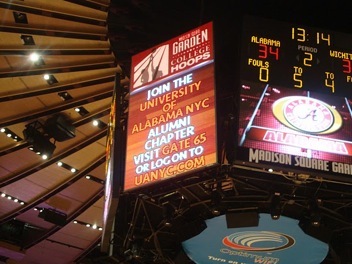 UANYC members were out in full force for Alabama's men's basketball team trip to New York City. NEW YORK -- The Greater New York Chapter showed strong support for Alabama's men's basketball team's trip to New York City for the semifinals and final of the 2011 Postseason NIT at Madison Square Garden. Over 60 chapter members and friends were in attendance to see the Tide's semifinal win over Colorado and for the team's hard-fought loss to Wichita State in the championship game. The chapter members also extended hospitality to Alabama fans visiting the Big Apple prior to the games with pregame gatherings at Stout before the semifinals and Brother Jimmy's Midtown before the championship game. Thanks to the efforts of UANYC President Advisory's Council member John Held and UANYC Membership Committee Co-Chairs Rebecca Mummert and Christian Martens, the chapter received promotion on the videoboard at MSG during the championship game.